strange website i dialled in the colour sceme and size on the bob jackson world tour, but there no option to get a price on it.what am i doing wrong. Back for a second third look, Joe; these are just gorgeous! All congratulations your way on a "value-added" investment that will last for decades and look beautiful throughout. A quick question: Did they mask the crown race seat, or will you be using a cutter to prep the seat for fitting? Just curious, because they are often painted over here, then prepped After. (Fourth look): That lining is sublime and the decals...well, just beautiful, Joe! Ah Dan i'm way ahead of you been drooling over that audax this past 2 hours its feckin CLASS. what a pity Thorn dont do a choice of painted bikes . Flamboyant for sure, Joe -- but I'd call it Electrifying Blue. Brilliant! Stunning frames. I also like the audax job with the detailing on the lugs. Some companies overdo the number of colours in the same frame, I much prefer the solid blue you've gone for. Silver or black components? 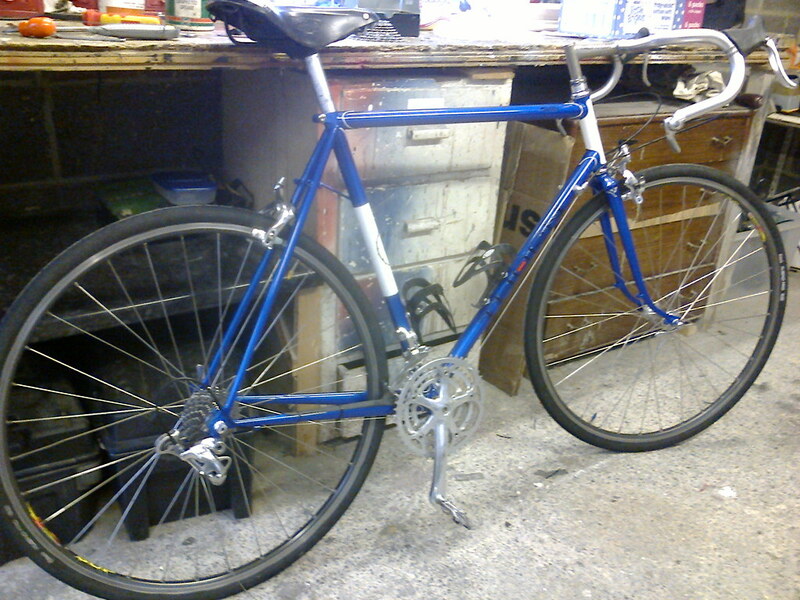 I also got a Thorn audax resprayed from Bob Jackson, and posted the below review. 1. Had to strip all parts off, including b/b and headset. 3. Specified orange frame and black forks, also black headtube. 3. Their collection / delivery was spot on. 4. They strip it back to bare metal. Their website gives details of the process. Its a very nice job, not perfect in a few places that only the owner would spot. I had no problem with the 4 weeks it took start to finish. Hi Dan, There was a little Paint on the race seat but the bottom race went on with a little persuasion. SG, I was admiring your Audax a few months ago on YACF, I was very, very tempted to copy it. The badges were all made up by Bob Jackson, I beleive that they work directly for Thorn anyway. Here are a couple of photos of my efforts so far. I've only managed a couple of hours in the workshop today and tomorrow I'm having a day out with the kids before going away again so it's going to be slow progress. Can't wait to see it complete. Good fun with the kids, then safe travel your way. SG, Just had another look at your Audax Classic. I really like the double chainset, I've been considering switching to an alpine double, something like a 28-42. I think Spa can supply custom chainsets, the trouble is I'd have to swap the lovely Royce Titanium ISO bottom bracket (that came with the bike) for a JIS one. Joe you gonna kill me for saying this but why didn't you get the seatpost painted as well,either that or use a nice carbon one it will look fantastic.sorry the negative comment but i certainly would not be using that seatpost of such a stunning bike. And for the finishing touch: What colour bar tape? The seat post does let it down. I've been trying to keep costs down by not replacing serviceable components. I have replaced the bars though. I think I'd quite like a new saddle, the B17 narrow has not been as comfortable as the standard B17's I have on two other bikes. I've got some black tape for the bars, I think the brown lether tape with matching saddle looks terrific and this might be a future upgrade. 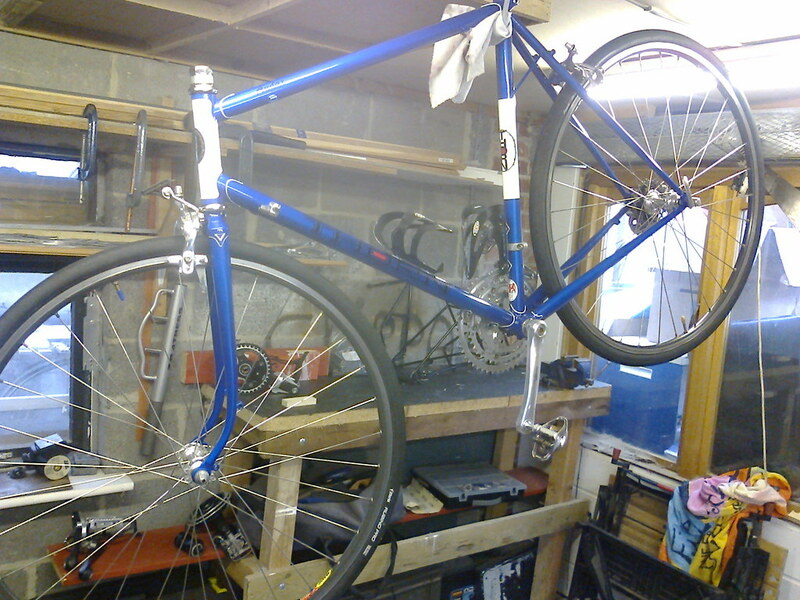 I might get an hour or two in the workshop tomorrow, if so I'll post an up to date photo.